Javier Solana's tea party or was it a Coffee klatch? "The European Union Special Representatives will gather on Wednesday 29 June for a seminar in Brussels. The seminar will provide the Special Representatives with an opportunity to discuss their work and to share their experiences. The EU High Representative will introduce the seminar with a few remarks. At this event, the first of its kind, the media is invited for a coffee meeting with all the EU Special Representatives at 14h45. The Special Representatives will be available for individual talks with journalists. The meeting will take place in the Justus Lipsius building press bar. " Solana’s words indicate he is giving his diplomatic corps (Special Representatives) a pep talk on how much the world is depending on a strong, confident Europe. In the meantime, Solana pushes ahead full throttle with his growing European army. He has recruited soldiers from Chile and Argentina. He has signed a treaty with the Ukraine, “allowing” them to participate in EU peacekeeping and military operations. His chief cabinet officer for the military end of Solana’s duties is Nick Witney. It is sometimes alternatively spelled in the press as “Nick Whitney” as was the case with the Herald-Tribune yesterday. Solana and Witney speak of having a ‘leaner’ EU military; however, the budget has grown much fatter since I released my latest version of my CD – from 165 billion Euros to now 180 Billion Euros for a total of $218 billion United States dollars equivalent. Considering that package along with Javier Solana’s long time statements that “the plan is to use NATO assets with European control of those assets”, we have a very formidable potential package for Dr. Solana. But of course, since its all for ‘peacekeeping,’ nobody has to to worry. Or do we? As usual, I value your comments. Enjoy what is left of your day! I was offline for a few days, but now I'm back -- Sorry! I'M STILL HERE -- RESEARCHING HEAVILY AND WRITING TOO -- NOT TO MENTION PRACTICING LAW AND KEEPING UP WITH MY FAMILY! --Commentary on Solana's latest moves to structure a justice system for Iraq (EUJUST Lex). This is significant because it involves training all Iraqi judiciary, policemen, and administrators of that system. What more would I need to control a country? How much do you want to bet he will end up with the oil as well as the police and judiciary? 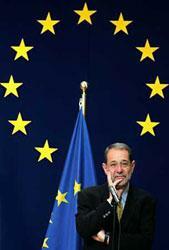 --Javier Solana has signed agreements with Argentina and Chile to send soldiers to his EU army. Query: What ever happened to the Monroe Doctrine? Is anybody in Washington watching? Does anybody care? --Commentary on the coming evacuation of the Gaza strip by Israeli settlers. --Material on Javier Solana's mother, Nieves Mathews, and her 'teacher,' Osho, better known to Americans as Bhagwan Shree Rajneesh. I did an "AskJeeves" (also Ask.com) search on Javier Solana today. I was surprised to see my own name, "Constance Cumbey" come up as THE related search. I clicked on that and the first reference was to a repeated lie Squeakbox has posted there attributing Reston, Virginia postings to me. He continues boldly and without substantiation to say that I visit there from time to time and post from there. I finally looked the area up on a map. I see that Reston, Virginia is the home of Dulles International Airport. I did ONCE in 1984 board a plane from Dulles to go to California for a speaking engagement. The internet didn't exist, to the best of my knowledge, in 1984. Maybe SqueakBox thinks I did it in a "different incarnation" -- we will wait with bated breath for his explanation -- but I doubt if he will make one. The favorite technique of those frantically trying to prevent honest dissemination of information on the New Age Movement (for the last 24 years in my experience) and now about what is transpiring with the EU's Javier Solana is to employ a big lie technique. Maybe I am being uncharitable. Squeakbox once recounted that he had suffered a closed head injury from a machete' attack in the jungles of his Central American home. At any rate, I will watch with interest to see his response here, or more likely, he will continue to defame me with his fictitious allegations all over the internet. It is hard to say which is of more concern to him: his "I love Javier Solana" postings or his "I hate Constance Cumbey" ones! I am working up a detailed article. If the demand is not too great, I can continue mailing my disk. One favor -- if you get a disk, don't tell your friends to write for their own. You are perfectly free and invited to burn a copy for them. I have placed my non-profit, educational work on this subject in the public domain. If and when I finish the book I have been working on since 1995, that might be a very different story, but the disk, you are free to copy and pass on! To obtain the disk while my very limited resources still permit, email me with your name, mailing address at cumbey@yahoo.com. Enjoy your summer weekend. I plan to! As usual, comments are welcome and invited. Javier Solana -- Our man in Baghdad? Post EU Constitution Rejection -- Our man in Baghdad? – Just What exactly is Javier Solana doing there? Why are we supporting it or is he supporting us? Is 'Barcelona' the payback? Many of you have my educational, public domain CD Rom on Javier Solana. I opened it with commentary on the three pivotal meetings held in June of 2004 which would firm the role of the EU’s Barcelona Process in the Middle Peace Process. I wrote that the reason for this was that the USA was obviously in trouble over Iraq. The EU would lend us its support – but for a price. The price was USA concurrence in the EU’s Barcelona Process using its various Treaties of Association between the Mideast countries. 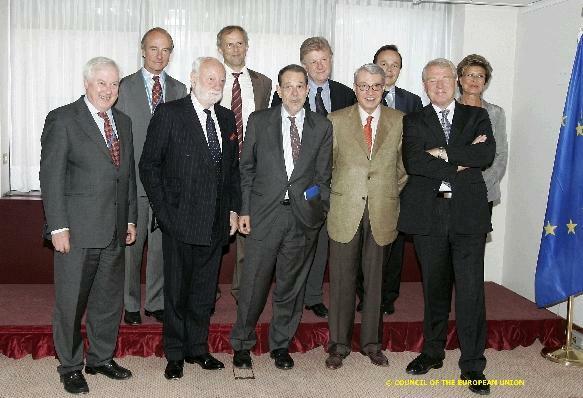 The one with Israel was signed in Brussels by the EU’s Javier Solana and Israel’s Shimon Peres. This happened on November 20, 1995. Two days later, the largest earthquake in Israel’s history rocked that region. Epicentered at Eilat, it registered, per the US Geological Service, 7.2 on their measuring scale. Those of you who have my disk have viewed the actual S and P waves for that quake with an even larger 7.3 mw reading from the Ontario Earthquake Research Center. Only one week after the treaty with Israel was signed and five days after that momentous quake, Javier Solana opened the Barcelona Conference. His opening words targeted Catholics and the 1095 crusade called by Pope Urban II. The Barcelona Conference had three agenda items per the preliminary news releases: (1) Battle religious fundamentalism – worldwide; (2) Favorable mutual trading terms for the basin “partners;” and (3) Get the USA out of the Mediterranean. Two days after Solana achieved his treaty and the Barcelona Conference ended, he was unanimously, to the utter surprise of the Spanish press, made the new Secretary General of NATO. He was best known back home as the country’s leading opponent to NATO! He stayed on the NATO job approximately 3 years and 9 months. He left his 4 year NATO appointment a little early -- to take new posts as the Secretary General of the European Union, and the Office of the High Representative for the Common Foreign and Security Policy. Approximately 6 weeks after taking the new posts he was also handed whatever military command of Europe was not handed him in the CFSP post -- by being given control of the ten nation Western European Union, a military federation. While still at NATO, Solana was given unusual powers by its constituent nations. He was given the sole say-so over whether Yugoslavia would be bombed or not. "Solana has the power and has had it since January 30th  said Madeleine Albright. We are speaking with one voice through Javier Solana." When President Clinton went on American television the night of March 21, 1999 to tell the American public the bombing was about to begin, he said, "I agree with Javier Solana's decision to do this." Nobody, to my knowledge, in the popular media, ever asked, "who's Javier Solana." Pope John Paul II and Eastern Orthodox Patriarch Alexiye were rebuffed in their requests to have the bombing halt 'between the two Easters' so that they could mediate a settlement. Instead, a civilian train was bombed during that same time frame. Now we fast forward to 2005 -- and we are coming up on the tenth anniversary of Barcelona. We heard a lot in the past year about the EU’s role in the Middle East Peace Process. We heard relatively little about its role in Iraq. Now that is coming out of the closet as well. So is “global governance”. 2005 is planned as its make or break year. The UN’s 60th anniversary is per Gareth Evans a perfect time to act. As in June 2004, there were significant conferences, the situation is likewise for 2005. The G-8 appears to be firming up a global redistribution process at the strong urging of co-Progressive Governance member, Tony Blair. The European Union is hosting a “Donor’s Conference for Iraq.” Javier Solana was in Iraq this weekend meeting with Iraqi officials. Looking cynically at the situation, under the guise of “rescuing the USA in Iraq” with a quid pro quo of USA deferral to EU aims in the “Greater European Neighbourhood” which includes Israel, the Palestinian Union and Jordan, it appears that the EU just might pick up the oil we coveted as well. This would take it a long way towards achieving Jacques Santer’s adopted urging the EU to dislodge the USA as a global superpower in the 21st struggle for resources. I suspect Javier Solana’s recent call for merging of all EU military resources immediately won’t hurt that cause either. Javier Solana looked so depressed after the EU constitution was voted down in France and Holland in the past two weeks that I almost felt sorry for him. A day or two later he was shown in jubilant mood with James Wolfensohn, outgoing World Bank president. Wolfensohn will now be serving as a special envoy to the Middle East by the “United States and its major allies.” He is to oversee the Israeli transfer to Palestinian Union. Troubled times are expected. I was especially concerned to see announcements that a known First Earth Battalion tactic was possibly set for use against Israeli settlers reluctant to surrender their homes and property: “The Screamer.” Its proponents admit its long terms effects on victims are unknown. For current information on the First Earth Battalion and its current influence in government, read Jon Ronson's THE MEN WHO STARE AT GOATS. Now Solana's dejection appears to be short lived. He appears to be recovered and back in full gear. Moreover, it looks as though the French rejection may have been advantageous to Solana's long term plans. A European Union think tank, TEPSA Friends Report contains a statement from a self-confident observer, one Cécile Barbier that Tony Blair was the first to say he would hold a referendum. It was to Tony Blair’s advantage to have the French go first as Blair was certain the constitutional issue would be defeated in any British referendum. By having the French go first, Blair was off an embarrassing hook. The observers said Tony Blair was hoping the French would vote NO so he could suspend the referendum in the UK. Thursday, a group of European Union members was in Baghdad, marking the first such high-level delegation visit to the country since the ouster of dictator Saddam Hussein. Javier Solana, the EU's top foreign policy official, and Britain's Foreign Secretary Jack Straw met with Iraqi officials to prepare for an international conference on Iraq. The EU and the United States are co-sponsors of the conference that will have "three main issues -- one that is related to politics in general. The second related to security, and the third related to what we may call rule of law," Solana said. The conference will be in Brussels, Belgium, on June 22. Solana said the delegation was meeting with "everybody," including government leaders and Sunni officials who "are not part of the mainstream of the political system." "We would like very much to see them incorporated. It will not be a successful transition without the participation of everybody," he said. Now the Donor’s Conference is being held. Horrible weapons are being planned for use against reluctant to leave Israeli Gaza Strip residents. Javier Solana is making plans for the seven year renewal from 2007 to 2013 of his Treaty of Association with Israel and other “Greater European Neighbourhood” parties. The G-8 is doing what Benjamin Crème’s Share International has called for years – global redistribution – with strings attached, of course. The European Space Agency and USA “Homeland Security” are on track for radical changes in personal identification and personal tracking – by 2008. It doesn’t appear to me that Javier Solana is going down. It looks to me like he might just be getting started – and so far, unfortunately, it appears that the USA is his partner, albeit a sucker one. As usual, I hope I have read the situation wrong. As usual, I value your comments. As part of my research on the New Age Movement which started in 1981, I discovered Jim Channon and his First Earth Battalion. An openly "New Age operation with planned allegiances to "Person/Planet" rather than to Nation State, they pioneered a number of bizarre techniques that were employed per Jon Ronson, author of the new THE MEN WHO STARE AT GOATS, in such diverse operations as Waco and Abu Ghraib. Now it appears that hapless Israeli settlers in the Gaza strip are about to be the recipients of their planetary pioneering! Go to http://www.tepsa.be/. There is an option to download the report “The ratification process of the Constitutional Treaty: the cases of France, the Netherlands and Luxembourg.” It is available both in French and English. THE EU CONSTITUTION IS GOING DOWN - JAVIER MAY SURVIVE! Update as of June 4, 2005: Because of the importance of the subject and the continuing activity on the comments page, I have not given into the temptation to post a new blog -- but I just found the attached blogspot that has vital insights on what is happening in Europe -- the Democratic deficit. You Herb Peters fans might find this especially interesting. I did! The EU Constitution is going down. French and Dutch voters have resoundingly defeated it. After the French defeat, the British announced their referendum would be "called off" if it did not pass in Holland. Similar to his pronouncement last year to Israel's Ariel Sharon that "like it or not, the EU is on board," Javier Solana now tells European Union countries the same thing -- like it or not, there will be a common EU diplomatic service. There will be a common military sharing all countries' resources alike. I thoroughly read the proposed EU constitution. In short, it was heavily weighted power-wise in favor of the Foreign Ministry position. Solana requested and got a designation for that position a little more than 11 months ago, at the end of June, 2004. He has been proceeding with speed on building his cabinet. What now? Javier Solana, in my studied opinion, desperately wanted the Constitution to be ratified. As I read him and it, he wanted it more to give himself legitimacy in his expanded new powers. He already has the powers by virtue of Section 666 of the EUROPA documents, Recommendation 666 introduced by him in the Western European Assembly and made the treatied law of Europe in December 2004 at the Nice Conference. He completely controls the Western European Union and is still Secretary General of the European Union. He is still the Office of the High Representative of the Common Foreign and Security Policy. He alone has the keys to the Galileo European Space Agency Project designed to be fully operational by 2008. In all of this he has enormous clout and resources at his disposal. The European meeting is coming up this month. The EU-USA summit is also coming up this month. It will be hosted by President Bush at the White House. Before going, Solana will most likely tell the EU member heads that he needs full and even expanded powers to deal with the USA top leadership as a peer. As they have done for the past ten years, they will again most likely cooperate with Javier Solana. As I see it, he has had expanded powers since taking his EU job in September of 1999 and near full powers after receiving the WEU -- a ten nation military federation -- on or about November 20, 1999. The Euro is decreasing in value against the dollar. It is being widely reported in the press and popular TV media that Europe is now "in crisis." Will the defeat of the Constitution make Solana go away? Probably not. It now appears to me that denied his popular vote legitmacy that speaking metaphorically we may now have a wounded and angry beast on our hands. The next few weeks should be very interesting -- and possibly perilous. As my good friend Herb Peters puts it, 'stay tuned.' As usual, I value your comments!